Illumina today announced two new systems, the NextSeq 500 and the HiSeq X Ten. I think we can all see that the NextSeq 500 is there to compete with (a.k.a. destroy) the Ion Proton, and in their own words, the HiSeq X Ten system is there to “sequence entire nations”. These are pretty amazing announcements from Illumina, but I want to get on to the politics of this rather than raw statistics. The NextSeq 500 will retail for $250,000 apparently, and this will really make people think when previously they may have bought a MiSeq or a HiSeq 2500 (or an Ion Proton). It’s a really interesting entry into the market and will shake things up as smaller labs become capable of really high throughput sequencing. 120Gb is 1 human genomee at 40X coverage, and 400 million reads is 16 RNA-Seq samples at 25M reads per sample. Really, though, this blows the Ion Proton out of the water. This is clearly an interesting move. I chatted with an unnamed source from Illumina and they told me a few things. The “human only” mode is nothing to do with chemistry, it is to do with software, which means you can probably hack it to sequence other species, but you’ll likely break your warranty. In my view, this is clearly aimed at competing with Complete Genomics. I was at ICG8 recently and CG claimed a 30X increase in throughput. Clearly Ilumina had to respond and the HiSeq X Ten is it. CG is limited to human, and as soon as CG compete in other species (which they will), Illumina will too. The big difference is that CG’s limitation is technical, whereas Illumina’s is imposed by software, and I don’t know how the non-human communities are going to take that. The other interesting thing I gleaned, and I quote, is that Illumina are “being approached by whole countries asking us to sequence their populations”. Clearly the HiSeq X Ten is the system they will use. So let’s do the maths: 18,000 genomes * $135 depreciation per genome * 4 years = $9.72 million, which squares with the rumour of $10M price tag for the X Ten system. 18,000 genomes * $65 = $1.17 million on staff and overheads to run the thing per year. At many institutions I know of this would be enough to employ ten members of staff. So actually, I think they might be right in claiming the $1000 genome – if you do 18,000 human genomes per year for four years on each X Ten system. 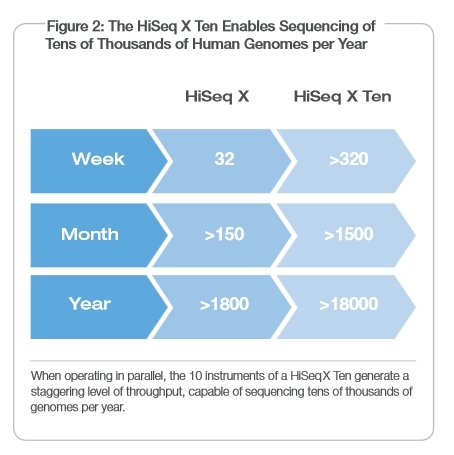 That’s a lot of human genomes though…..
With the NextSeq 500 they are competing with Ion Proton, and with the X Ten they are cornering the human market and competing with CG. I say competing, but actually this is more of a slaughter. The elephant in the room is Oxford Nanopore, and the fact Illumina are focusing on Ion Proton and CG seems to suggest they don’t think that ONT are a threat. With the MAP recently announced, they may be wrong on this – only time will tell!